A new report has been published by Transparency Market Research, titled “Negative Pressure Wound Therapy Market - Global Industry Analysis, Size, Share, Growth, Trends and Forecast 2014 - 2020”. TMR, a market intelligence company based in the U.S., states in its report that the global negative pressure wound therapy market was estimated at US$1.5 billion in 2013 and, growing at a remarkable CAGR of 10.2% from 2014 to 2020, is predicted to reach US$2.9 billion in 2020.The TMR report states that negative pressure wound therapy (NPWT) is a leading wound care therapy, which applies negative or sub-atmospheric pressure on a wound in a closed drainage system. Negative pressure wound therapy aides wound healing by stimulating the granulation tissue, by lowering edema, and increasing blood circulation. NPWT systems can be utilized for treating traumatic wounds, surgical wounds, pressure sores, and chronic wounds such as venous stasis ulcers and diabetic foot ulcers. The study states that based on the type of devices, negative pressure wound therapy systems are segmented into single use NPWT systems and conventional NPWT systems. In terms of disposables, the conventional NPWT systems are further segmented into pumps, canisters, and dressing kits. 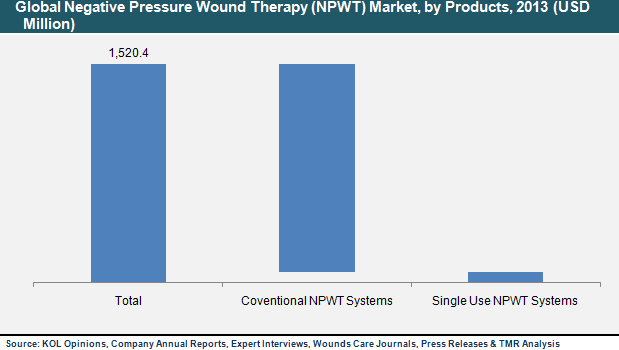 Additionally, NPWT systems can also be utilized for treating injuries such as meshed skin grafts and burns.As per this report, in terms of product segments, conventional negative pressure wound therapy systems constituted the biggest market segment, but the single use NPWT systems market segment is expanding at a higher CAGR – of about 17 % – during the forecast horizon between 2014 and 2020. The negative pressure wound therapy market is experiencing a conspicuous shift from utilization of conventional NPWT systems to single use NPWT systems. This shift in inclination is majorly due to the higher convenience offered by single use NPWT systems to patients, as well as their cost advantage over conventional systems and higher portability. The report states that the key factors contributing to the expansion of this market are the rising global geriatric population and rising incidence of chronic diseases such as diabetes and cancer. Moreover, increased awareness on advanced wound care devices is also stimulating the growth of this market. However, increase in healthcare expenditure as well as fluctuating economic conditions have resulted in hampered growth prospects for the global NPWT market.As per this TMR research report, the market is segmented into North America, Europe, Asia Pacific, and Rest of the World (RoW). North America is the biggest market for NPWT systems due to supportive reimbursement policies. Europe represents the second biggest market for NPWT systems owing to high occurrence rate of transit accidents. Asia Pacific is predicted to witness the highest growth owing to robust economic development, increasingly favorable government policies, and increase in demand for technologically developed wound care products.